1. 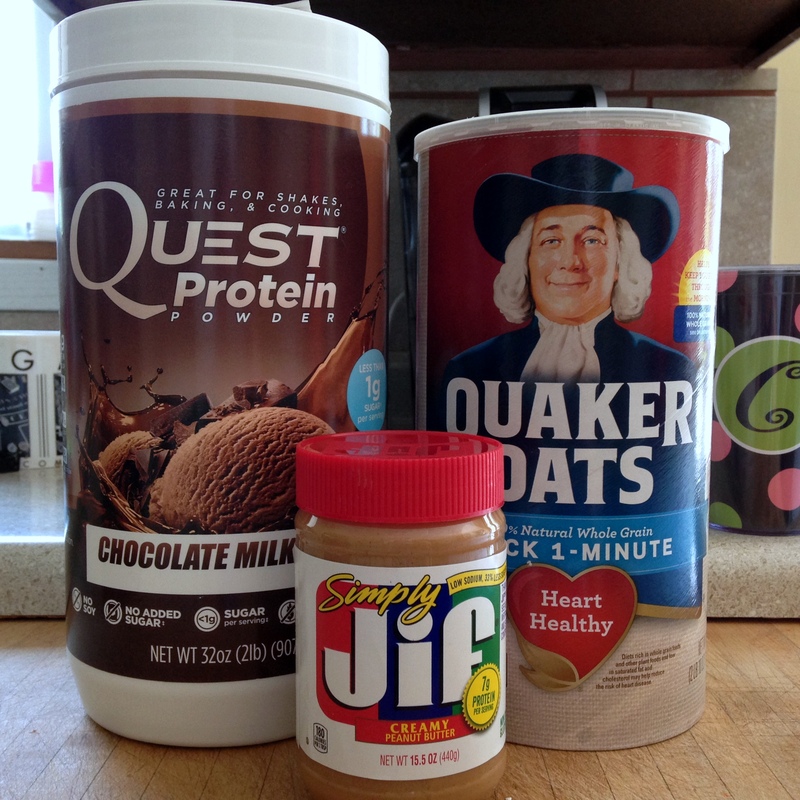 Oatmeal mixed with a spoonful of peanut butter (use your favorite kind) and a half to 3/4 scoop of Quest chocolate protein powder. I take a 1/2 cup of dry oatmeal with about 1 cup of hot water and mix together with the peanut butter and protein powder. After it’s mixed pretty good, I microwave it for one minute, then stir again. Then, I put it back in for 40 seconds. After it’s done, I take it out, stir it again and then pop it in the freezer for just a bit or add a couple of ice cubes. I do this to cool it off quickly and because I don’t like to eat it real hot. I like it lukewarm. I also like it quite thick; the kind of thick that when I turn the spoon upside down, there’s no way it will fall off! If you like it thinner, definitely add more water. I love this breakfast because to me, it tastes like a warm monster cookie. Kind of. I love it! For Weight Watchers people, here’s the breakdown of the PointsPlus values: 1/2 cup oatmeal = 4 PPVs, 1/2 scoop of protein powder = 1 PPVs, 1 tbsp peanut butter = 3 PPVs. Total points = 8. (And totally worth it!) I also eat a banana with this breakfast, which is 0 PPVs. 2. Seven Sundays muesli. Any flavor. I take 1/2 cup muesli with about 1/3 cup water and mix it all together. Most often, I try to let it sit overnight, but sometimes, I forget and then I just do it in the morning and let it sit for at least 15 minutes. Then, I mix in one container of Yoplait Light in very vanilla and about 1/3 to 1/2 cup fresh blueberries. O to the M to the big fat G! SO FRIGGIN’ DELICIOUS! I almost love this more than my oatmeal. Actually, I probably do. For Weight Watchers people, here’s the breakdown of the PointsPlus values: 1/2 cup muesli (any of the flavors) = 6 PPVs, 1 container of Yoplait Light yogurt = 2 PPVs, fresh blueberries = 0 PPVs. Total points = 8. (And again, totally worth it!) I also eat a banana with this breakfast, too, which is 0 PPVs. 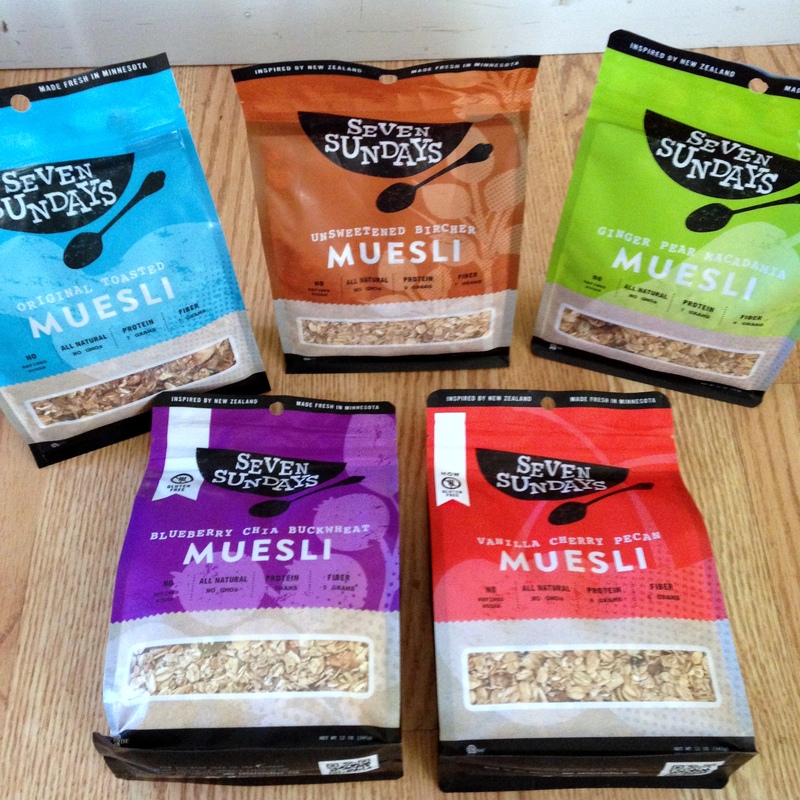 By the way, I had heard of the Seven Sundays muesli quite some time ago, but had never tried it. I finally got to taste it when the company had a booth at the Foodie Four Mile race awhile back. They were handing out samples and I ate mine and most of Al’s, too. I have been hooked ever since. And, I have now tried a few other brands, but hands down, Seven Sundays is THE BEST. Seriously, THE BEST! 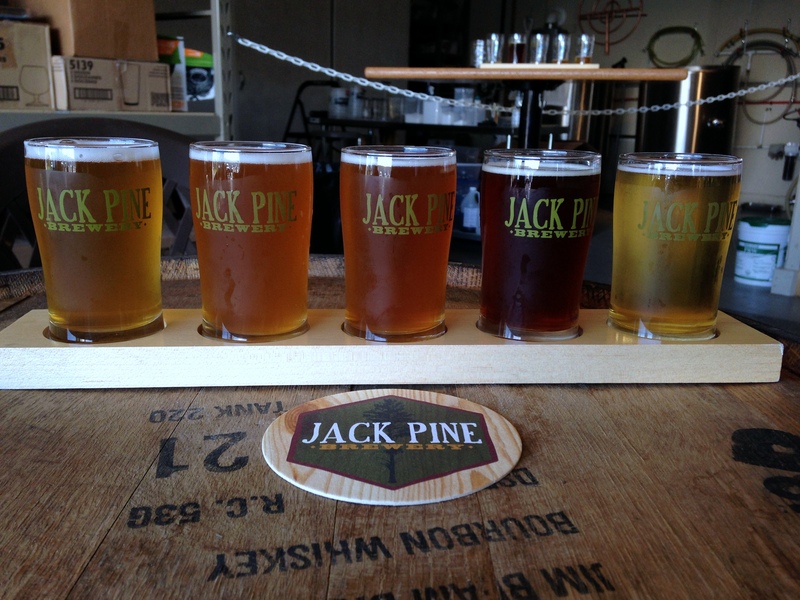 Make sure to check out the website (CLICK HERE) and read or listen to the story of how this Minnesota company came to be. Actually, spend a little time on the website, it’s pretty cool. Or at least in my opinion it is. 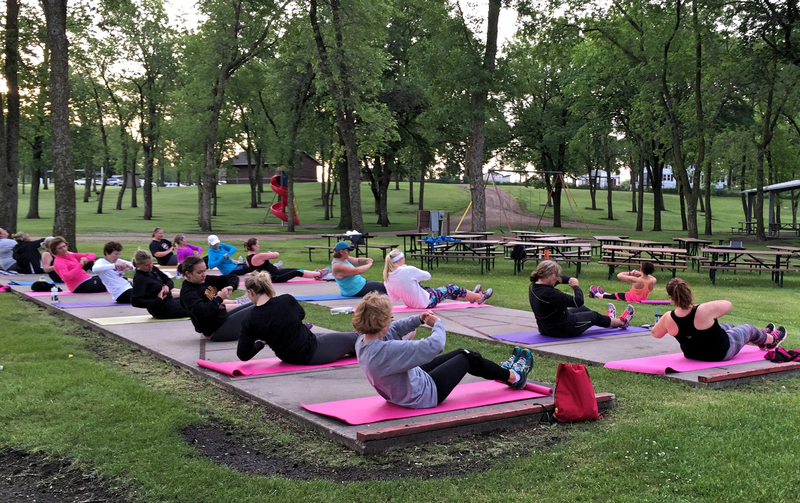 My morning beginner bootcamp class at the Alexandria City Park is going SO WELL! We are having so much fun. And, knock on wood, the weather has been fantastic! The only thing we’ve dealt with (just a few times) are mosquitos. Oh, the joys of living in Minnesota. I mean, seriously, how can you beat that view? So worth the mosquitos. I guess! After I got done with class on Tuesday of this week, I decided to go for a run. I ended up running six miles and then I walked one mile. 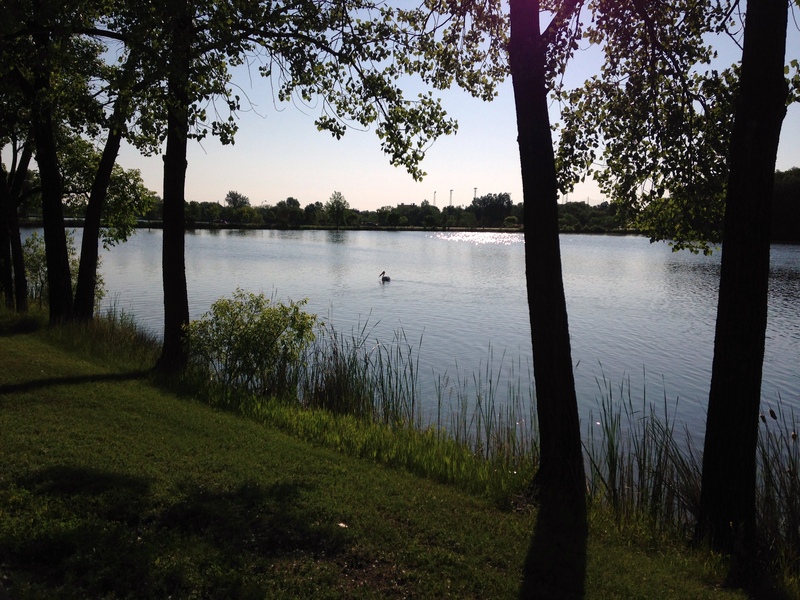 This is a smaller little lake I ran past and I saw this pelican. I seem to have this infatuation with pelicans and I could have stayed and watched this guy swim all day. Loved it! 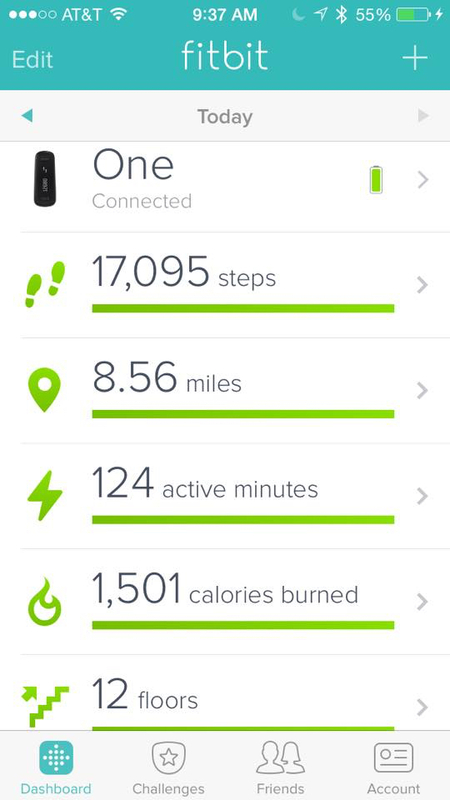 After I got back, I checked my FitBit and I had nearly 18,000 steps in and it wasn’t even 10 a.m.! How cool is that? 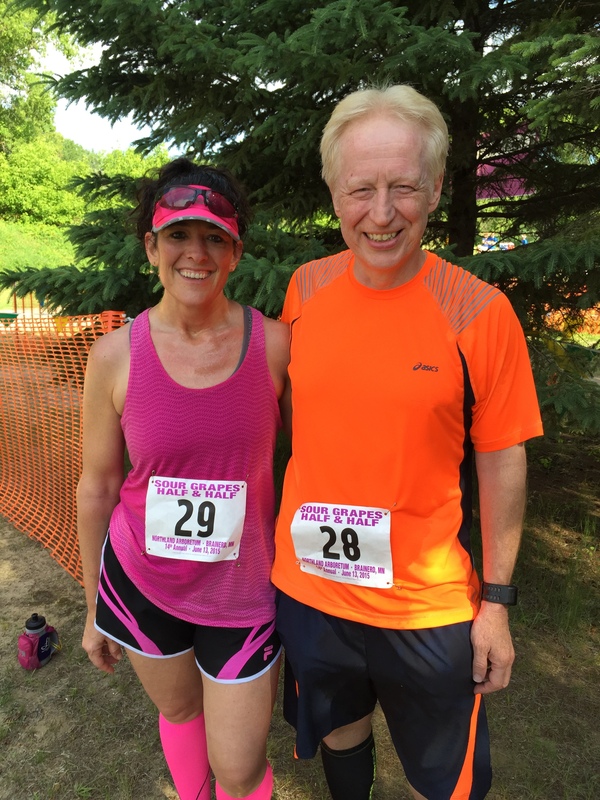 After the race. You can’t really tell on the photo, but my tank was drenched. I was so hot and sweaty, but again, the race was fun! I get why people do trail runs, but I don’t think I would want to do them all the time. 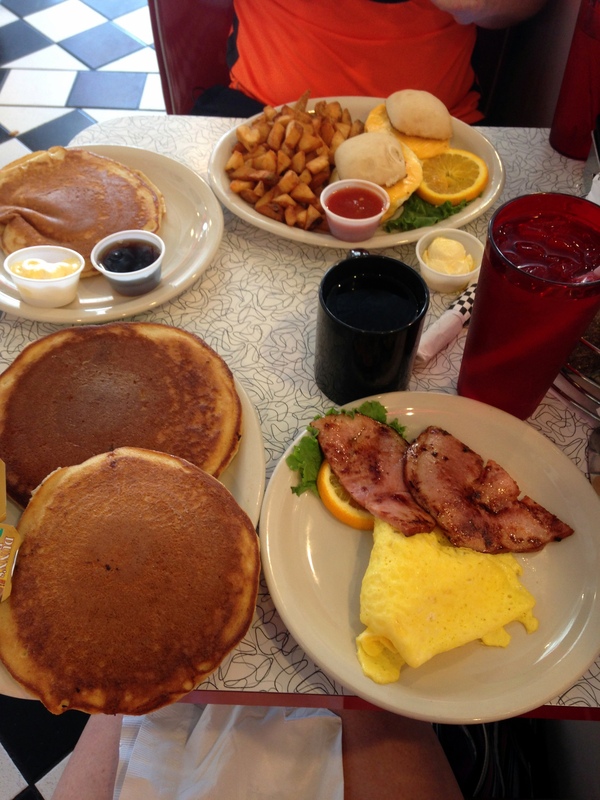 This was our breakfast after we finished the trail race We ate at the 371 Diner. I ate all my eggs (made with egg substitute), my ham and one pancake. I brought the other pancake home. Yes, we had margaritas AFTER we drank beer. Kind of a sin, I know. But oh-so-much-fun! 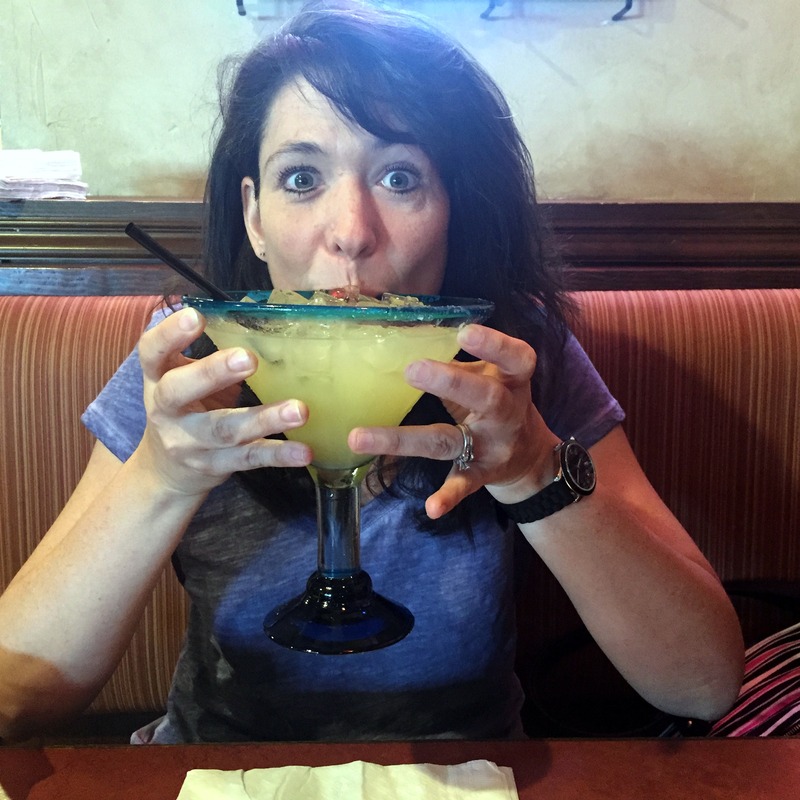 After we got back to the hotel after Jack Pine, we decided to walk over to the local Mexican restaurant, Poncho and Lefty’s, and take advantage of the last few minutes of happy hour. 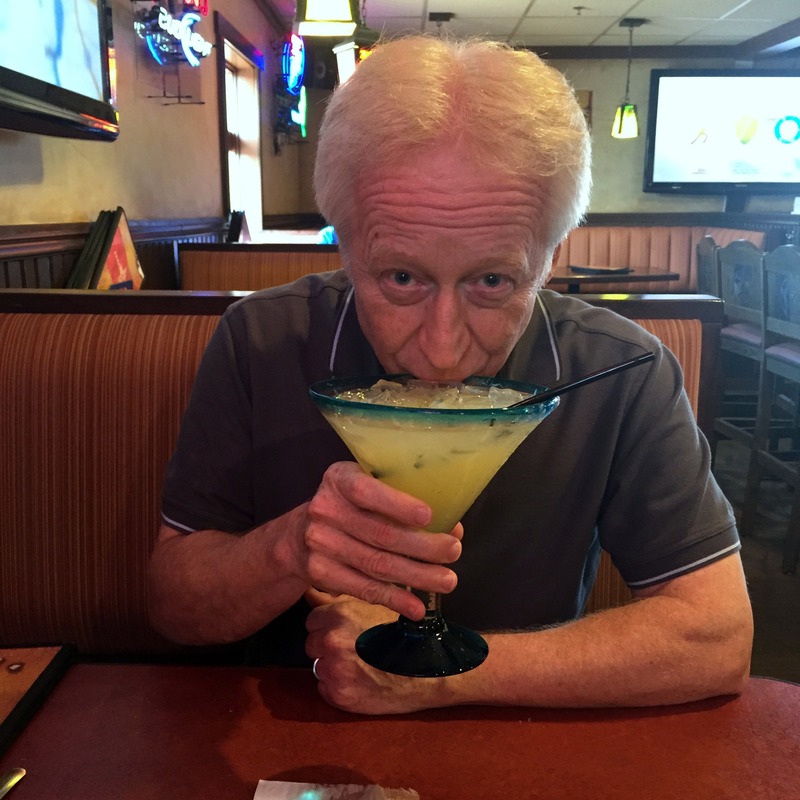 And yes, the margarita was a jumbo one! It was DELICIOUS! We also ate there; we shared the steak quesadilla’s and had the chips with salsa and the guacamole dip. Yum! 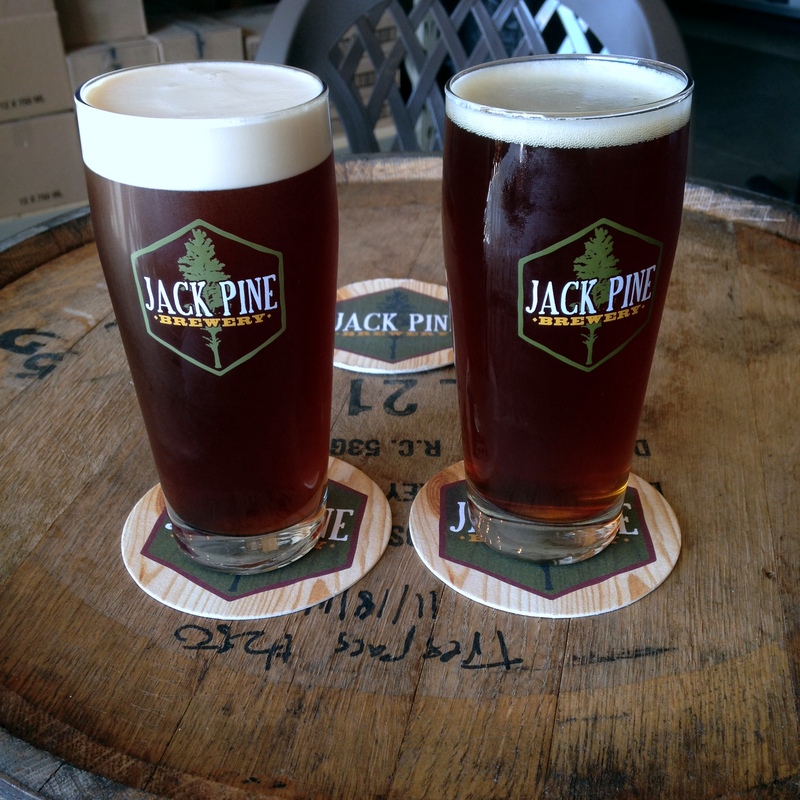 As most of you all know, my hubby and I like to have our Saturday night “Date Nights” where we try new foods and maybe indulge in a little red wine or perhaps a new beer. Well, this past Saturday, we channeled our inner Irish (although neither of us are Irish) and dined on a most unusual meal. Well, unusual to us anyway. And oddly, we made things that neither of us likes. Or thought we didn’t like. 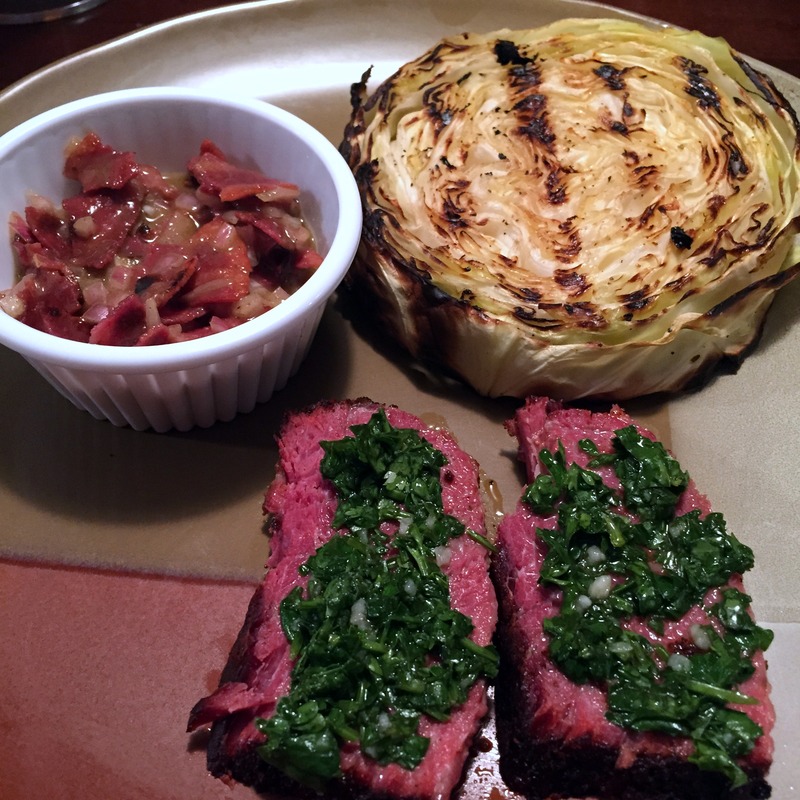 Yep, that there is corned beef brisket (with a chimichurri sauce on top), along with grilled cabbage (with a homemade turkey bacon, dijon mustard, honey dressing). So, here’s the thing, I don’t like corned beef and Al doesn’t particularly care for cabbage. But, we both loved the meal. All of it. It was so tasty. Ridiculous tasty. If you want the recipe for the cabbage, click HERE. Keep in mind that we used turkey bacon so there was no bacon fat to add to the dressing. Thank God! I mean, come on, bacon fat? Eww! The cabbage and dressing were a total of 7 PPVs and the brisket with the chimichurri sauce was about 7 PPVs. Again, totally worth it. The meat was so tender. Although it was definitely a different meal for us, we would both eat it again. Yum! 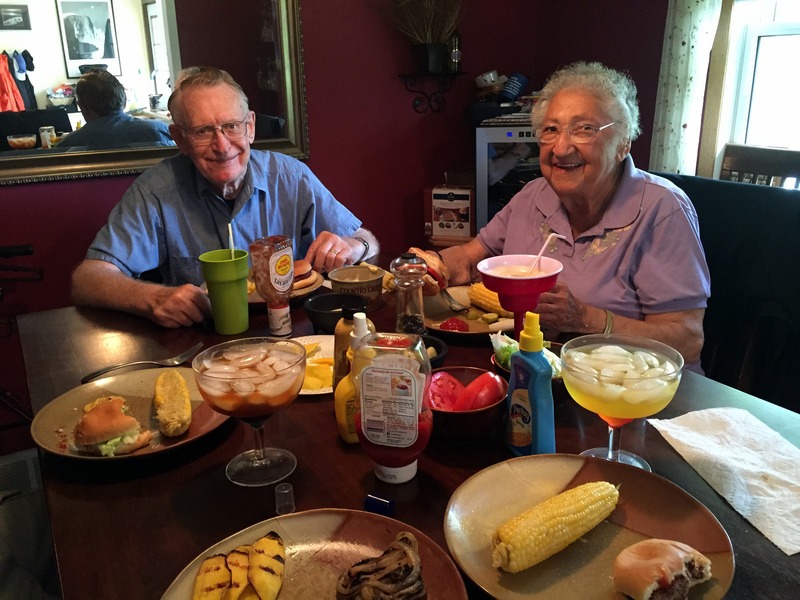 On Father’s Day, my mom and dad came over for supper and we fixed them the quintessential summer supper – hamburgers on the grill, corn on the cob, fresh tomatoes, grilled onions and grilled mangoes. We had ice cream bars for dessert! It was so much fun and the food was of course, outstanding (thanks to my awesome hubby!). 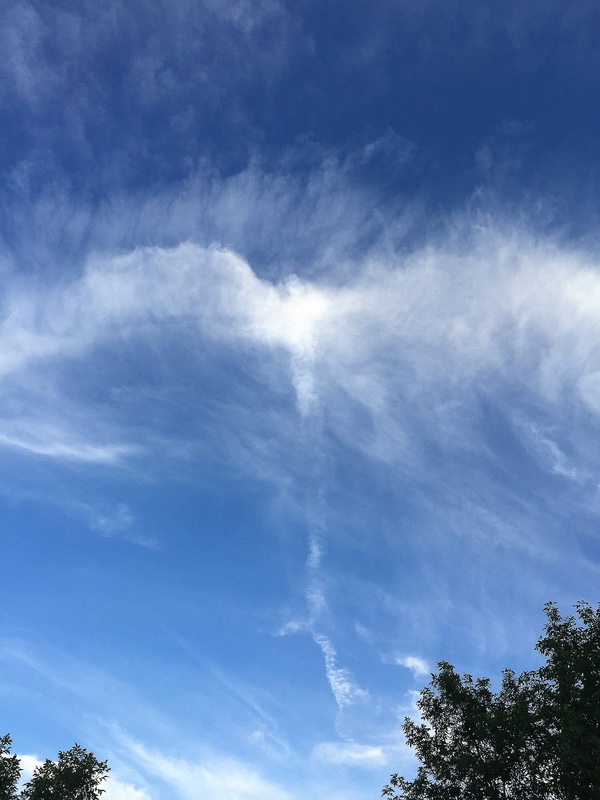 This was taken sometime this week and both Al and I, when we saw it, immediately said it was an angel. I thought it was my sister, Donna; he said it was his mom, Lynn. Isn’t it spectacular? Love, love, love it. I am such a cloud person anyway and this is by far, the best cloud I have ever witnessed. As it moved along, it ended up resembling a peace dove, which I didn’t capture in a picture. Wish I would have. And then, it didn’t take too long, and before you knew it, they were both gone – definitely too soon! 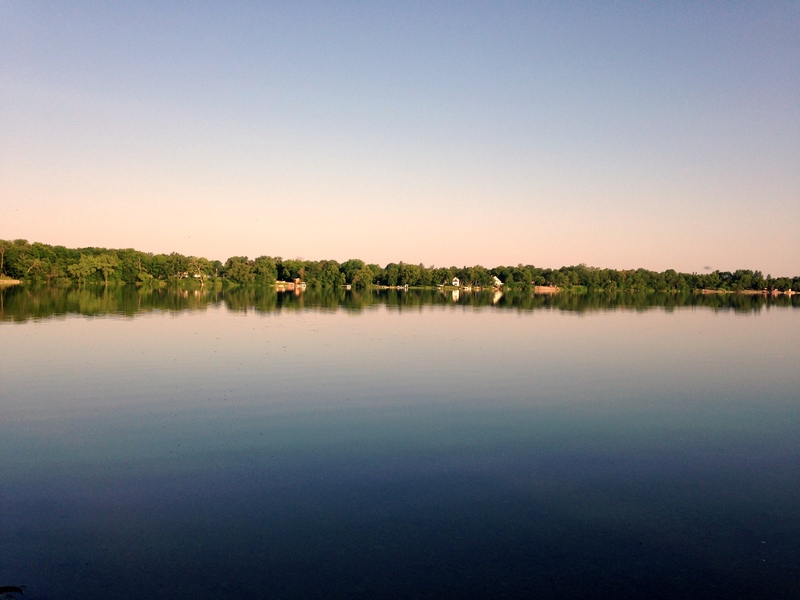 I am going to leave you with another photo from our Brainerd weekend. These days, I don’t spend too much time on my hair. 1. Humidity. 2. I get up most mornings at 4 a.m. and my hair is the last thing I care about. It usually goes in a ponytail! Because I actually spent time on it (too much time! ), it actually turned out and looked half-way decent. I was not only having a good hair day, I was also having an I-feel-good-about-myself kind of day. (My women readers might understand this better!) I liked the way my clothes fit, felt and looked. 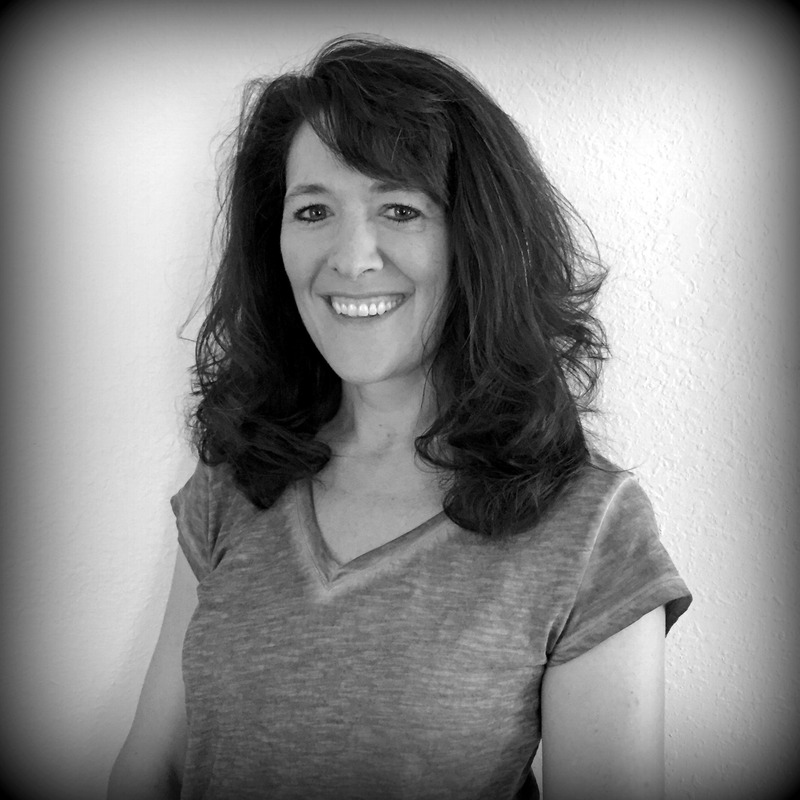 So, I had my hubby take a picture and it didn’t turn out too bad so I thought I would share it with all of you! Hope you like it! 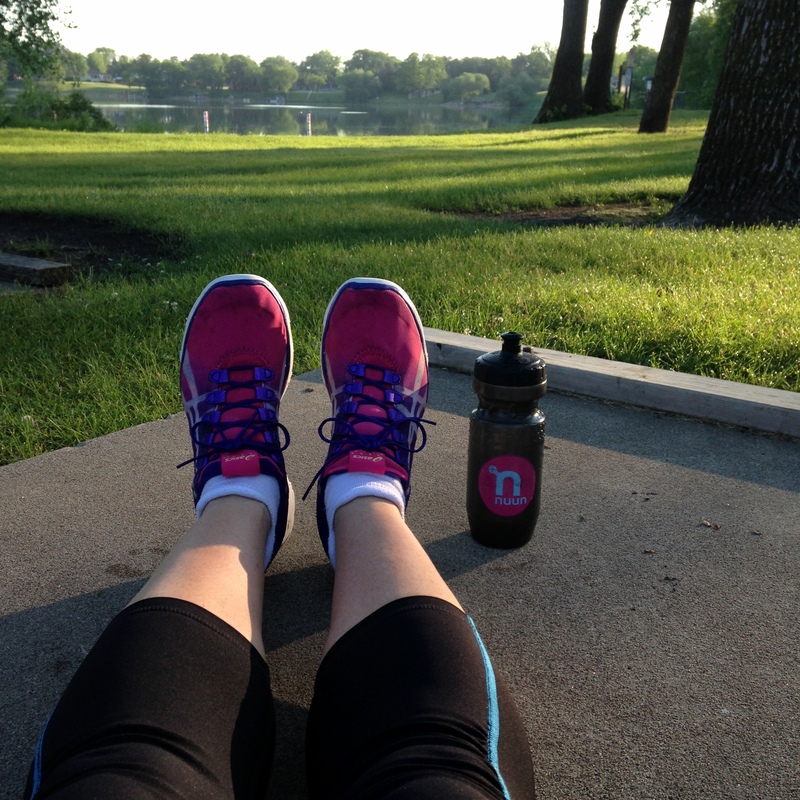 Previous Previous post: Jumping jacks, squats AND mosquitos!